Hello, Friends Today I Am Showing on This Post Remove FRP Lock Google Account on Samsung mobiles. 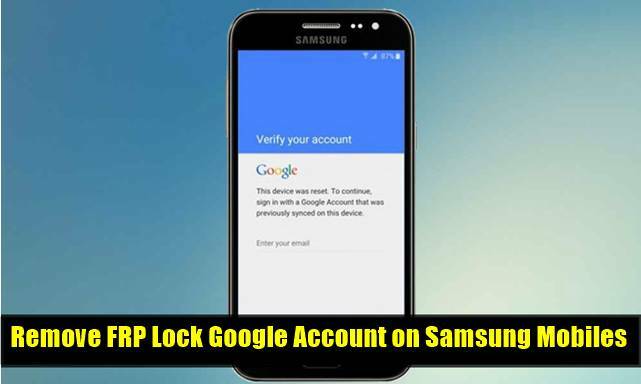 You can Easily solve Your Remove FRP Lock Google Account on Samsung mobiles Problem. 1 What is Device Protection, or Factory Reset Protection (FRP)? 1.1 How does FRP work? First You Know What is FRP? FRP Mens Factory Reset Protection. Android devices give inbuilt safety features you’ll use to shield your device and data, together with screen locks and encoding. information protection, or works Reset Protection (FRP), maybe a security feature on humanoid devices with Lollipop five.1 and better. FRP is mechanically activated after you established a Google Account on your device. Once FRP is activated, it prevents the use of a tool when a works information reset, till you log in employing a Google username and secret antecedently established on the device. When you perform a mill knowledge Reset, all settings area unit came to the mill default settings. All knowledge is erased, as well as files and downloaded apps. If you’ve got a Google Account found out on the device, FRP is active. this implies that when the reset, you will be needed to log in to the Google Account victimization the username and positive identification. If you’ve got multiple Google Accounts found out on the device, you’ll be able to log in victimization any of the accounts. If associate degree unauthorized person tries to reset the device by another technique, the device would still need log-in victimization the Google username and positive identification. this implies that if your device is lost or purloined, another person wouldn’t be ready to reset it and use it. It is undoubtedly terribly annoying to be stuck at the Google Account Verification window when you’ve reset your device, particularly after you do not keep in mind the Google Account details you fed in antecedently. the requirement to bypass Samsung Google Account Verification step throughout the fitting method on your tablet/smartphone is incredibly well based and that we perceive the inconvenience caused to you if you’re prevented from continuing additional while not submitting your Google ID and parole. Since the “Next” choice on the Google Account Verification screen remains colorless out till you sort in your e-mail/phone and parole, here square measure ways in which to bypass Samsung’s step to verify your Google Account. Read on to grasp a lot of and therefore the best thanks to bypass Samsung lock screen. FRP bypass tool, higher called works Reset Protection bypass tool is that the best code to avoid the Google Account Verification step whereas putting in your Samsung device. you’ll be able to transfer and use this tool to bypass the Samsung Google Account Verification method and access your device once you’ve got performed a works reset. Firstly, use the link given below to transfer the FRP Tool file. Once you’ve got with success downloaded it, copy it on a pen drive.